Strategy for securing annexed territory. 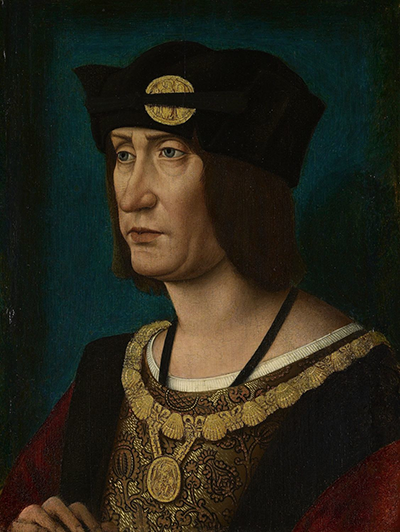 Charles VII from 1494 to 1498. Charles invaded Italy to enforce his claim to Naples. This invasion strikingly demonstrated the enormous military superiority of France relative to the Italian powers, but it also illustrated the point (which is Machiavelli’s main concern in the first 11 chapters) that holding a territory is much more difficult than its conquest. Indeed France was quickly driven out of Italy by a coalition of Italian and outside powers, led by Pope Alexander VI (Borgia). It had little lasting impact, except in Florence, where it caused the overthrow of the Medici and the founding of the republic in which Machiavelli served. Charles died in 1498, before he could return to Italy. Louis XII from 1499 to 1504. In contrast with the invasion of Charles, Louis’ invasion aimed primarily at the conquest of Milan and only secondarily at Naples. It also had much more serious consequences for Italy. Louis, promptly drove out Milan’s ruler, Ludovico Sforza, and after a brief re-conquest by Ludovico, Louis succeeded in holding the Milanese territory for more than a decade. Second, to avoid war with the Spanish kingdoms of Ferdinand and Isabella, Louis signed with them the Treaty of Granada, which partitioned the lands of the King of Naples between the French and Spanish. Thus, Louis’ invited into Italy the only power that could pose a threat to his conquest. Third, in Louis’ invasion two Italian powers (Venice and the Pope) collaborated with Louis XII. The collaborators may not have wanted the invasion, but given that they thought it likely, they tried to profit by it. Venice promised aid to Louis in return for new territory up to the river Adda. There was controversy in Venice, but most of the elite thought that the French invasion would harm their enemy Milan and therefore, do more good than harm. Machiavelli disagreed. He felt that the Venetians were merely exchanging an old enemy for a new and much stronger one. The Pope saw in the French invasion an opportunity for a bargain that would further his goal of reasserting his authority over towns of the Romagna and the Marches that were allegedly papal vicars but were in reality independent states. The Papacy had lost control of much of the Papal States during the time when the Papal Court moved to Avignon and the subsequent period, known as the Great Schism, when there were a series of rival popes on both Rome and Avignon. The bargaining opportunity came about in the following way. When in 1498, Charles died without an heir, Louis Duke of Orleans became king and reigned as Louis XII. Upon his ascension, Louis at once asserted his claim to the Duchy of Milan. However, before he could launch a foreign war, Louis had to secure his French holdings. In particular, Charles had extended the French state by marrying Ann of Brittany. To keep Brittany firmly annexed to France, Louis needed to marry Ann, who was his second cousin. Louis suffered also from the inconvenience of a previous marriage and still living wife. These domestic inconveniences stood in the way of his planned adventures in Italy, so Louis turned for help to the Holy Father, Pope Alexander VI. Alexander dispatched papal diplomats to Louis’ court, and after many twists and turns, Cesare, and Louis struck a bargain. According to its terms, Cesare would gain (A) the Duchy of Valence, (B) Marriage with Charlotte d’Albert, the sister of the King of Navarre, and (C) French troops for his conquest of the Romagna. With Valance, Cesare acquired the title by which Niccolò often referred to him, Duke Valentino. From the bargain, Louis would gain (A) his divorce (B) a Cardinal’s hat for a favorite counselor, George d’Amboise, (C) Cesar’s assistance in Louis’s planned invasion of Milan. By remaining true to his word and aiding Cesare, Louis greatly strengthened the most powerful of Milan’s neighbors, the Papacy. Then by remaining Cesare’s ally Louis also alienated the weaker powers in the Romagna which he should have defended. Finally, instead of consolidating his hold in the North by colonizing Lombardy, Louis sought to hold it by force-of-arms (rather than by colonization) and quickly turned his sights to Naples. As you will see, Machiavelli believed that Louis had more prudent options available to him. In this way you have enemies in all those whom you have injured in seizing that principality, and you are not able to keep those friends who put you there because of your not being able to satisfy them in the way they expected, and you cannot take strong measures against them, feeling bound to them. For although one may be very strong in armed forces, yet in entering a province one has always need of the goodwill of the natives. For these reasons Louis [XII], King of France [1462 - 1515], quickly occupied Milan, and as quickly lost it; and to turn him out the first time it only needed Ludovico’s own forces; because those who had opened the gates to him, finding themselves deceived in their hopes of future benefit, would not endure the ill-treatment of the new prince. It is very true that, after acquiring rebellious provinces a second time, they are not so lightly lost afterwards, because the prince, with little reluctance, takes the opportunity of the rebellion to punish the delinquents, to clear out the suspects, and to strengthen himself in the weakest places. Thus to cause France to lose Milan the first time it was enough for the Duke Ludovico to raise insurrections on the borders; but to cause him to lose it a second time it was necessary to bring the whole world against him, and that his armies should be defeated and driven out of Italy; which followed from the causes above mentioned. When (in 1453) Mehmed II capped his conquest of the Eastern Roman Empire by taking Constantinople, he moved his capital from Adrianople to the conquered city. Again, the prince who holds a country differing in the above respects ought to  make himself the head and defender of his less powerful neighbors, and  to weaken the more powerful amongst them,  taking care that no foreigner as powerful as himself shall, by any accident, get a footing there; for it will always happen that such a one will be introduced by those who are discontented, either through excess of ambition or through fear, as one has seen already. The Romans were brought into Greece by the Aetolians; and in every other country where they obtained a footing they were brought in by the inhabitants. And the usual course of affairs is that, as soon as a powerful foreigner enters a country, all the subject states are drawn to him, moved by the hatred which they feel against the ruling power. So that in respect to those subject states he has not to take any trouble to gain them over to himself, for the whole of them quickly rally to the state which he has acquired there. He has only to take care that they do not get hold of too much power and too much authority, and then with his own forces, and with their goodwill, he can easily keep down the more powerful of them, so as to remain entirely master in the country. And he who does not properly manage this business will soon lose what he has acquired, and whilst he does hold it he will have endless difficulties and troubles. 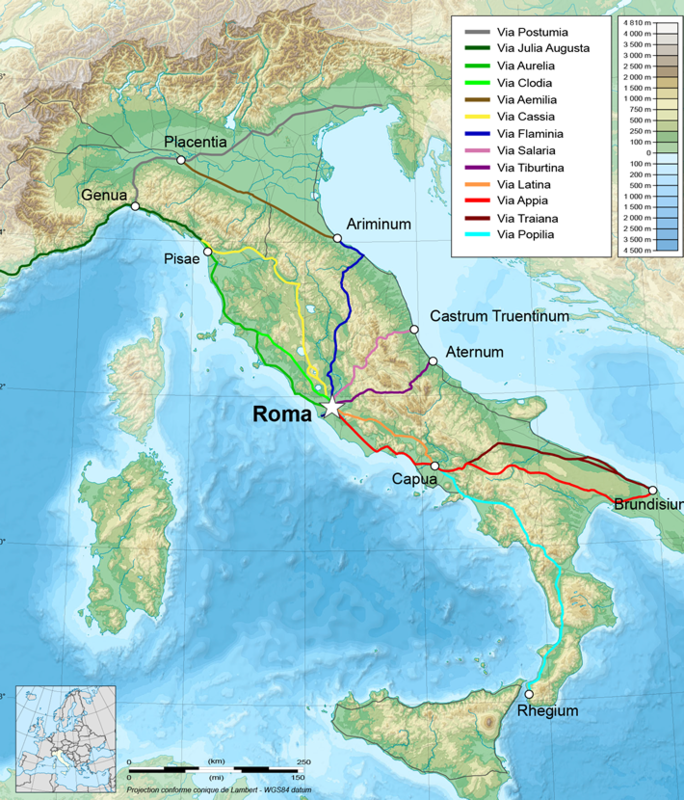 The roman road system shows how extensively it used colonies in its conquest of Italy. The Atlas of the Roman World (p 38 tells us) “The first great Roman highways were built in the age of conquest and had a strategic function, linking Rome to her Latin colonies.” The Atlas contains (pp 34 38) enlightening maps of the colonies and roads. Greece appears to me sufficient for an example. The Achaeans and Aetolians were kept friendly by them, the kingdom of Macedonia was humbled, Antiochus was driven out; yet the merits of the Achaeans and Aetolians never secured for them permission to increase their power, nor did the persuasions of Philip ever induce the Romans to be his friends without first humbling him, nor did the influence of Antiochus make them agree that he should retain any lordship over the country. Because the Romans did in these instances what all prudent princes ought to do, who have to regard not only present troubles, but also future ones, for which they must prepare with every energy, because, when foreseen, it is easy to remedy them; but if you wait until they approach, the medicine is no longer in time because the malady has become incurable; for it happens in this, as the physicians say it happens in hectic fever, that in the beginning of the malady it is easy to cure but difficult to detect, but in the course of time, not having been either detected or treated in the beginning, it becomes easy to detect but difficult to cure. This it happens in affairs of state, for when the evils that arise have been foreseen (which it is only given to a wise man to see), they can be quickly redressed, but when, though not having been foreseen, they have been permitted to grow in a way that everyone can see them, there is no longer a remedy. Therefore, the Romans, foreseeing troubles, dealt with them at once, and, even to avoid a war, would not let them come to a head, for they knew that war is not to be avoided, but is only to be put off to the advantage of others; moreover they wished to fight with Philip and Antiochus in Greece so as not to have to do it in Italy; they could have avoided both, but this they did not wish; nor did that ever please them which is forever in the mouths of the wise ones of our time:—Let us enjoy the benefits of the time—but rather the benefits of their own valor and prudence, for time drives everything before it, and is able to bring with it good as well as evil, and evil as well as good. But let us turn to France and inquire whether she has done any of the things mentioned. I will speak of Louis (and not of Charles [VIII, 1470 - 1498]) as the one whose conduct is the better to be observed, he having held possession of Italy for the longest period; and you will see that he has done the opposite to those things which ought to be done to retain a state composed of divers elements. King Louis was brought into Italy by the ambition of the Venetians, who desired to obtain half the state of Lombardy by his intervention. I will not blame the course taken by the king, because, wishing to get a foothold in Italy, and having no friends there—seeing rather that every door was shut to him owing to the conduct of Charles—he was forced to accept those friendships which he could get, and he would have succeeded very quickly in his design if in other matters he had not made some mistakes. The king, however, having acquired Lombardy, regained at once the authority which Charles had lost: Genoa yielded; the Florentines became his friends; the Marquess of Mantua, the Duke of Ferrara, the Bentivogli, my lady of Forli, the Lords of Faenza, of Pesaro, of Rimini, of Camerino, of Piombino, the Lucchese, the Pisans, the Sienese—everybody made advances to him to become his friend. Then could the Venetians realize the rashness of the course taken by them, which, in order that they might secure two towns in Lombardy, had made the king master of two-thirds of Italy. Let anyone now consider with what little difficulty the king could have maintained his position in Italy had he observed the rules above laid down, and kept all his friends secure and protected; for although they were numerous they were both weak and timid, some afraid of the Church, some of the Venetians, and thus they would always have been forced to stand in with him, and by their means he could easily have made himself secure against those who remained powerful. But he was no sooner in Milan than he did the contrary by assisting Pope Alexander to occupy the Romagna. It never occurred to him that by this action he was weakening himself, depriving himself of friends and of those who had thrown themselves into his lap, whilst he aggrandized the Church by adding much temporal power to the spiritual, thus giving it greater authority. And having committed this prime error, he was obliged to follow it up, so much so that, to put an end to the ambition of Alexander, and to prevent his becoming the master of Tuscany, he was himself forced to come into Italy. And if anyone should say: "King Louis yielded the Romagna to Alexander and the kingdom [ of Naples] to Spain to avoid war," I answer for the reasons given above that a blunder ought never to be perpetrated to avoid war, because it is not to be avoided, but is only deferred to your disadvantage. And if another should allege the pledge which the king had given to the Pope that he would assist him in the enterprise, in exchange for the dissolution of his marriage and for the cap to Rouen, to that I reply what I shall write later on concerning the faith of princes, and how it ought to be kept. Thus King Louis lost Lombardy by not having followed any of the conditions observed by those who have taken possession of countries and wished to retain them. Nor is there any miracle in this, but much that is reasonable and quite natural. And on these matters I spoke at Nantes with Rouen, when Valentino, as Cesare Borgia, the son of Pope Alexander, was usually called, occupied the Romagna, and on Cardinal Rouen observing to me that the Italians did not understand war, I replied to him that the French did not understand statecraft, meaning that otherwise they would not have allowed the Church to reach such greatness. And in fact it has been seen that the greatness of the Church and of Spain in Italy has been caused by France, and her ruin may be attributed to them. From this a general rule is drawn which never or rarely fails: that he who is the cause of another becoming powerful is ruined; because that predominance has been brought about either by astuteness or else by force, and both are distrusted by him who has been raised to power. Louis XII 1462-1515. Attribution: By Jean Perréal (vers 1455-1527/29) (Windsor, collections de S.M. la Reine d'Angleterre) [Public domain], via Wikimedia Commons. Here Niccolò takes up the problem of how to build an empire by annexing territory. In context of the other chapters, we see he ranks this as more difficult than simply inheriting territory, but less difficult than building a new state from scratch. Recall that Machiavelli is concerned, not with the difficulty of conquest, but the difficulty of holding new territory. He understands, what the architects of America’s adventures in Vietnam and Iraq did not, that holding a territory can easily consume more power than the conquest. Furthermore, Machiavelli clearly believes the energy required to secure annexed territory increases with the amount of change required to integrate it into the Prince’s holdings. The best case is therefore, when the annexed territory has the same language and customs as does the prince’s powerbase. Then only administrative changes are required. Even in this case, however, Machiavelli advises the prince to minimize change. Viewed from the 21st century, we are inclined to think that this advice (at least the first part) is very naughty. However, in the context of Niccolò’s Italy things look different. At that time the family was not just the primary social unit, it was also the primary unit of political, economic and often military power. Principalities, i.e. most of the city-states of Italy, were ruled by powerful families. Marriages among powerful families were primarily alliances and arrangements for the transfer of military and economic assets from one generation to the next. A prince who has just annexed a territory should realize that the main threat to his keeping it will come from the powerful family that he has dispossessed and they will never cease trying to organize a re-conquest. The prince must eliminate this threat. If the situation were reversed they would do the same. Indeed, if you do not eliminate them, they will attempt to eliminate you. Decisive calculated ruthlessness is a lesser evil than a protracted vendetta war of attrition that will materially damage the disputed territory and sap the resources of both sides. Indeed, when (as in the 100 Years War or the Hapsburg/Valois wars in Italy) the option of eliminating an enemy’s entire family is not available, the results can be catastrophic for both sides. Send colonies or if it is feasible, move your capital to the newly conquered territory. Do not try to hold the territory with military bases. Weaken the strong powers in the region so that they cannot aspire to dominance. Never, strengthen someone that is already strong. If you make someone powerful, you can only have done so by virtue of your force or your cunning, and for these capabilities, the person that you have advanced must distrust you. Strengthen the weak powers so that they can defend themselves, and therefore do not invite aggression by their stronger neighbors. Rely on your own resources and avoid overreach. If you can take a new territory by your own power, do so. But if your own power is insufficient, do not make an alliance with an external power that can later challenge you. If potential challenges to your dominance develop, take prompt and decisive preemptive action. Do not postpone feasible preemptive action to neutralize a growing threat, hoping that the problem will resolve itself. And avoid half measures that will not completely eliminate the issue but will merely leave festering resentment. This document uses the Project Gutenberg EBook of The Prince, by Niccoló Machiavelli, translated by W. K. Marriott. Notes are provided by Gene Gessert 2015.